“The Taiwanese Cabby” is a graphic creation depicting the features of Taiwanese society through the eyes of a cabby who is winding through the streets of Taiwan. In order to illustrate the various local lifestyles that are characteristic of the country, the chosen subjects are shown through the windows of different taxis. Thus, the nightclubs, roadside food stalls, national symbols and citywide convenience stores are all seen from the perspective of the cabby who, himself and his way of life, is reflected in the interior of the car. The transitions through different times and sceneries are illustrated in detail so that the highly contrasting views of the city, as they present themselves to the cab drivers day and night, become clear. Thus, a panorama of multifaceted impressions is shown, ranging from vivid, advertising-dominated images of inner-city areas to rural tranquillity with places for religious worship. 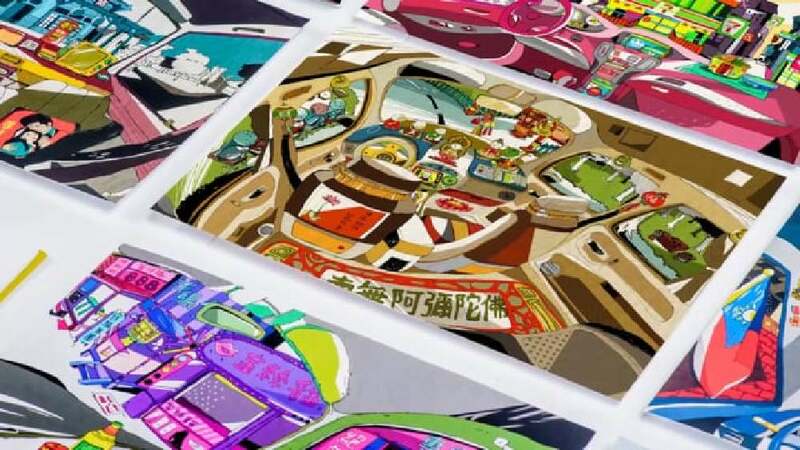 These scenes are complemented by impressions of the individual lifestyles of the cab drivers, illustrated through the interiors of their cabins, featuring traditional Asian emblems or modern TV displays. This work is an outstanding achievement in that it expresses the different lifestyles of Taiwanese society, exemplified by the lives of today’s cab drivers. Viewers slip into their role and, through a fisheye lens, are shown highly vivid and detailed images, seen from the drivers’ perspectives. Complemented by salient illustrations in comic style, the work thus has emerged as an original and multifaceted rendition of this country.